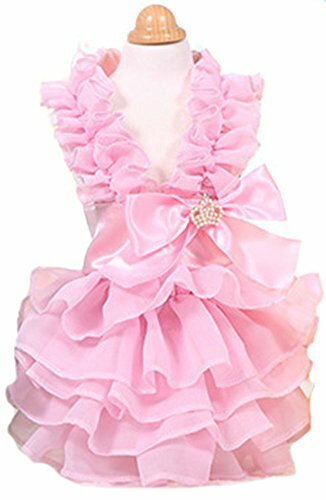 This cute and adorable dress for dogs and cats comes with pink tulle for amazing look. You little princess will look super cool. 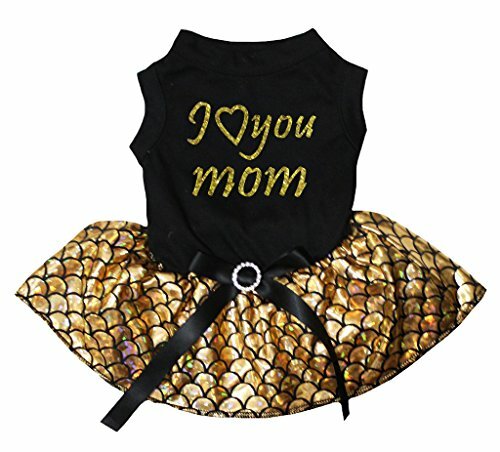 Plus, it comes with this print "I love my mommy". 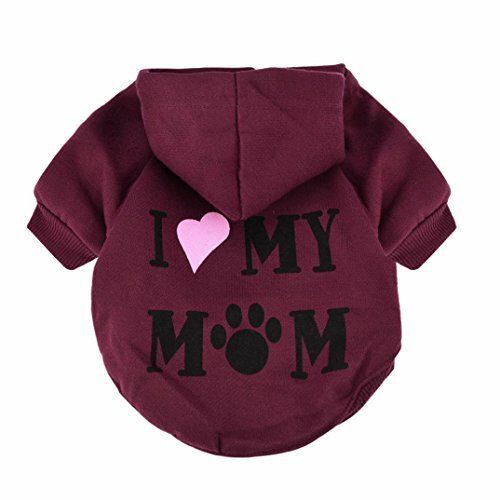 Must have in your pooch wardrobe. 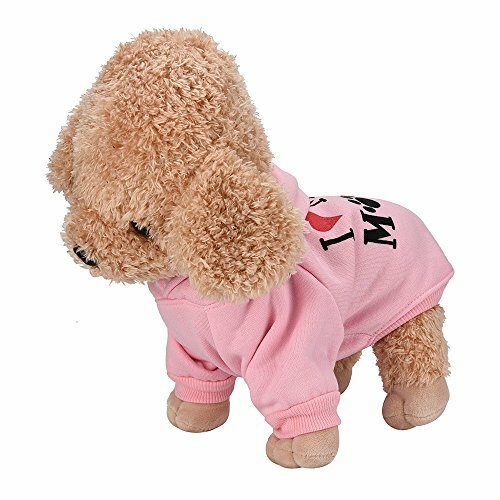 Suitable for breeds: Chihuahua, Shih-tzu, Yorkie, Bolognese, Pekinese and other. Please, check sizes according to size chart for each item before purchasing. Different designs can have different measurements on the sizes. Care Instructions: Hand wash cold separately. Only non-chlorine bleach when needed. Lay flat to dry. Cool iron on reverse if needed. To see more similar products, please click the brand name MaruPet or browse in our store Sister Amy. 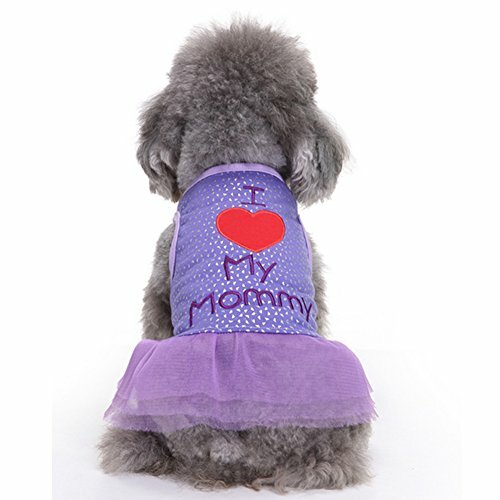 Bib Information: Color: Purple and Blue for you to choose Material: Cotton Suitable pet:Dog/Cat Package List: 1 x Pet Apparel Size: Neck(CM/Inch) - Chest (CM/Inch) - Body(CM/Inch) XS:20cm/7.87"-30cm/11.81"-21cm/8.26" S:24cm/9.44"-35cm/13.77"-25cm/9.84" M:30cm/11.81"-42cm/16.53"-29.5cm/11.61" L:33cm/12.99"-48cm/18.89"-33cm/12.99" XL:37cm/14.56"-55cm/21.65"-38.5cm/15.15" Shipping Weight: 0.6Kg Occasion: Pet Supplies Return Policy: Free exchange for wrong item shipped or item damaged. For DO NOT LIKE STYLE/COLOR reason or size problem, customer's responsibility to return the items to China. Due to manual measurement, it allows 1-2(cm) discrepancy. Please be reminded that due to lighting effects and monitor's brightness/contrast settings etc., the color tone of the website's photo and the actual item could be slightly different. Thanks for your understanding! 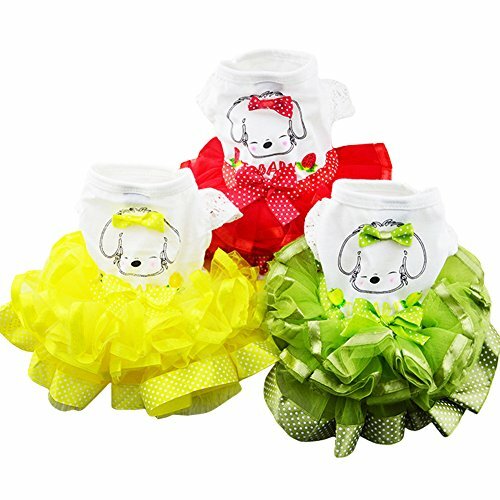 Fashion Pet Bubble Skirt Fruit Color Puppy Dog Dress Costume Beauty Pet Princess Dress Recommend to choose one/two size up. Size Table Size --- Body ----- Chest ---- Neck XXS --- 6.00" ----- 9.85" ------7.09" XS ----- 7.87" ---- 11.81" ---- 8.27" S ------ 9.84" ----- 13.78" --- 9.45" M ----- 11.81" --- 15.75" --- 10.63" L ------ 13.78" --- 17.72" --- 11.81" XL ---- 15.75" --- 19.69" --- 12.99"
★Asian Size:XXS--Bust:24cm/9.4"--Neck:16cm/6.3"--Length:16cm/6.3" ★Asian Size:XS--Bust:30cm/11.8"--Neck:18cm/7.1"--Length:19cm/7.5" ★Asian Size:S--Bust:36cm/14.2"--Neck:22cm/8.7"--Length:24cm/9.4" ★Asian Size:M--Bust:42cm/16.5"--Neck:26cm/10.2"--Length:29cm/11.4" ★Asian Size:L--Bust:48cm/18.9"--Neck:30cm/11.8"--Length:34cm/13.4" Note: 1.♥About the Order: If you have any problems about the order ,please contact with us by email . we would reply it within 24 hours. Thanks! We will try our best to help you solve the problem. 2.♥About the Shipping Methods: we have two delivery methods: EUB delivery or DHL delivery(expensive cost). Shipping cost is different , before you order, please take into consideration carefully. Thanks! Eub delivery: usually it takes 8-25 days to arrive you. DHL delivery : usually it takes One Week to arrive you. 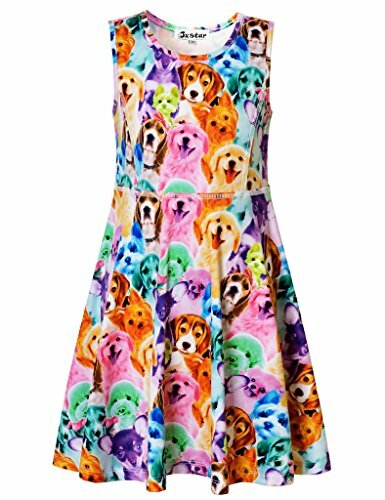 Dog dress/dog shirt/chihuahua/Love Me Ruffle Dog Dress FREE SHIPPING-LARGE ONLY! 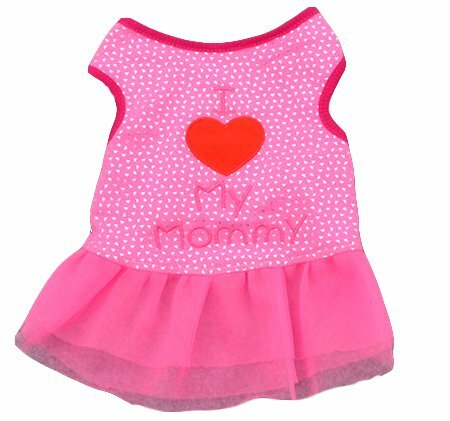 Simply Wag Dog SMALL Pink Dress "LOVE BUG"